standard-title Corporate Partner – Clinical Trials Our Corporate Partners understand the importance of providing free patient services through our Direct Connect program and are committed to helping us KEEP those services free. If interested in becoming a Corporate Partner, please contact Dellann Elliott Mydland, President & CEO, by phone at 425.785.8489 or via email at Dellann@EndBrainCancer.org. Our Corporate Partners understand the importance of providing free patient services through our Direct Connect program and are committed to helping us KEEP those services free. If interested in becoming a Corporate Partner, please contact Dellann Elliott Mydland, President & CEO, by phone at 425.785.8489 or via email at Dellann@EndBrainCancer.org. In order to improve patient outcomes, fuel research and ultimately help to provide more treatment options and modalities for the brain cancer patient, EndBrainCancer Initiative (EBCI) relies on donors, sponsors, grants and Corporate Partners. Our Corporate Partners understand the vital importance of providing IMMEDIATE ACCESS to free patient services and programs to the brain tumor community through our “Direct Connect” personalized, one-on-one programs as well as our Education/Awareness/Outreach programs. 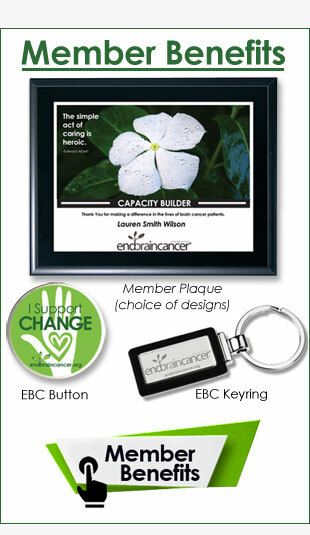 Our Corporate Partners are committed to helping us keep our services and programs free to the brain tumor community and to the general public as well as in allowing the team at EBCI to help make the brain tumor community aware of all treatment options, studies and clinical trials that may be available for brain tumor patients. We are especially excited to introduce you to the STELLAR Trial as this is a clinical trial for recurrent Anaplastic Astrocytoma brain cancer tumors of which, there are currently very few clinical trials. It is important to understand that currently, there are no targeted therapies for patients with with this rare disease. This is why Orbus is conducting the STELLAR trial, to evaluate the use of eflornithine oral solution – a targeted therapy – for treatment recurrent Anaplastic Astrocytoma. This trial is sponsored by our friends at Orbus Therapeutics, Inc. who are committed to bringing innovative treatments to the the extremely under served patients affected by rare disease. Please click here or on the Stellar logo above to learn more about this study and how to participate. Or, if you’d like to be personally connected and/or prequalified for this trial through our organization, please contact Tina Emerson-Hoffman at 425-444-2215 M-TH 9:30a-3:30p pst. For more information about Orbus Therapeutics, click here.